If this card is in your hand: You can target 1 “Photon” or “Galaxy” Xyz Monster you control; attach this card to it as material. If this card is Normal or Special Summoned: You can target 5 “Photon” and/or “Galaxy” cards with different names in your GY; shuffle them into the Deck, then draw 2 cards. You can only use 1 “Galaxy Cleric” effect per turn, and only once that turn. Happy Monday! We have a great Galaxy Photon Week starting with Galaxy Cleric. Cleric is a Level 4 Light Spellcaster-type monster with 1500 Atk and 600 Def. The stats are ok and certainly within theme, but Warrior would have been better to take advantage of ROTA. Otherwise, Cleric is searchable via many other cards in the main and extra deck for Galaxy Photon. It’s worth noting that both effects are mutually exclusive and once per turn. From the hand, you can attach Galaxy Cleric to a targeted Galaxy or Photon XYZ monster. Upon Normal or Special Summon, you can shuffle 5 targeted Galaxy or Photon cards with different names back into whatever deck they came from to draw 2 cards. Being able to recycle Extra Deck monsters back to draw 2 from the Main Deck is awesome. Or you can use it as material. The second effect is probably what makes the card worth running, but only at 2. 3 would be too many since you can’t really use the effect in the early game, and the Normal Summon would go to Knight or Wizard. Between the name and the healing effect, I think Galaxy Cleric is a great card for the theme and should be made again and again for other archetypes. I picked some cards this week since Bill was going to be busy, so I went with a Galaxy Week with the new Soul Fusion cards starting off with their new Level 4, Galaxy Cleric. Galaxy Cleric is a Level 4 LIGHT Spellcaster with 1500 ATK and 600 DEF. Stats are pretty meh on a Level 4, but LIGHT and Spellcaster are pretty good. If this card is in your hand, you can target a Photon or Galaxy XYZ monster you control and attach this card to that monster as material. XYZ Materials are a limited resource on XYZ Monsters, so this helps you get the effect of one of your XYZ monsters one more time, so that’s nice to have. If this card is Normal or Special Summoned, you can target 5 Photon and/or Galaxy cards with different names in your GY and shuffle them into the deck to draw two cards. The different names part makes this effect a little harder to trigger, but not impossible. Galaxy/Photon goes through its cards fairly quickly, so being able to recover them into the deck for future use is nice, plus you get a plus two. The only problem with effects like this is that they are dead early game. You can only use 1 Galaxy Cleric effect per turn and only once per turn, but I think it would be fine if both effects were just hard once per turns and didn’t limit you on using the other. Cleric is good recovery and it’s searchable, so one of it is just fine. 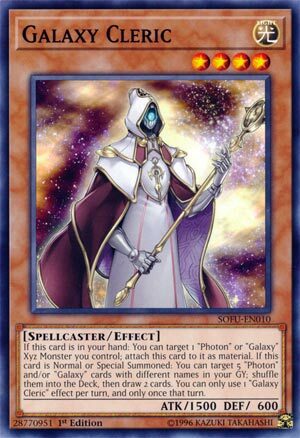 Galaxy Cleric kicks off Galaxy week, and we see we have here a Light Spellcaster Monster (good things) with 1500 attack/600 defense on a Level 4 (not the greatest) but this card does some good thing for a theme. First off, by targeting a Galaxy or Photon XYZ Monster of your control, you can attach this card to said Monster as an XYZ Material. More material means more use of an effect, so that’s a plus. The second effect here is a theme specific Pot of Avarice. Letting you target five cards from your Graveyard that are Galaxy and/or Photon (so long as they all have different names, to add to the challenge and keep the effect fair I reckon) and add them back to your Deck to allow you to Draw two cards. All of a sudden, the low attack and defense on this card don’t seem to be such an issue, do they? And, as if it surprises you, you can only use one of each effect per turn, and only once per turn, again to prevent rampant abuse. I like this card. It assists your XYZ Monsters, can let you Draw (likely making this a better card given the semi-difficulty of pulling that latter effect off, in a later part of a Duel). Good theme support for sure here on a solid card. Art: 4/5 Love the background, absolutely a cleric in art, and a nice spot of blue to support the Galaxy theme.